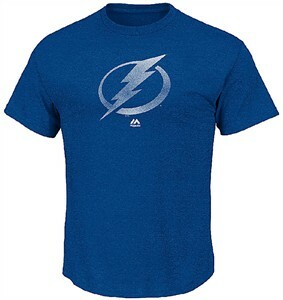 Fans can show off their fashion sense when they put on the Mens Tampa Bay Lightning Raise The Level Blue Heather Short Sleeve Tee Shirt from Majestic. This 5.29 oz. 100% Cotton shirt comes with a regular fit body that is machine washable. With a distressed front screened Lightning graphic everyone will know who you cheer for on game day.